It’s a gorgeous winter’s morning – too gorgeous really to be called winter – for a drive through New South Wales countryside towards Reidsdale, near Braidwood. We pass plenty of paddocks, dotted with resting sheep and cows, a blur of pale yellow ochre under a crisp, bright blue sky. It’s a day for truffle hunting. We’re greeted in Braidwood by Kate Marshall, a Sydney girl turned country. Instantly it feels as though we’re old friends reuniting. 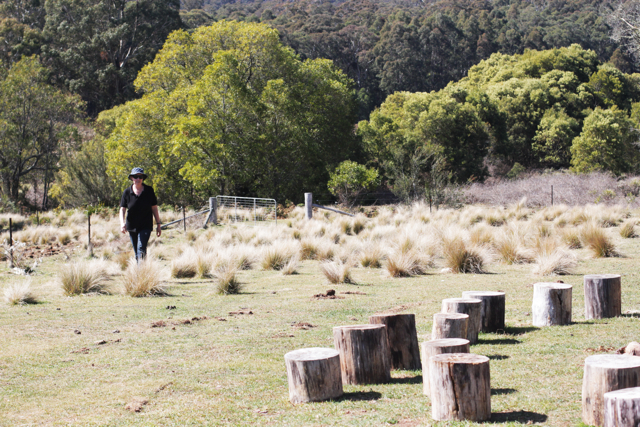 She shows us the way to the property, the home of Terra Preta truffle farm. 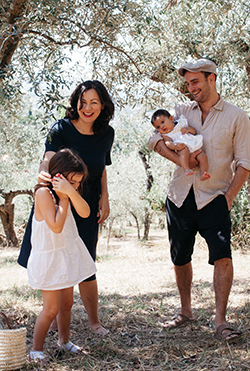 Peter and Kate Marshall have had their truffle-inoculated trees for about twelve years now but before their foray into truffle farming, Peter was a forester, so he knows a thing or two about trees to say the least. I suspect this is probably one of the things that gives Terra Preta an edge. They don’t use pesticides or herbicides and try to treat their truffle farm like a natural forest, mimicking the environment that naturally occurring black truffles thrive on in France. 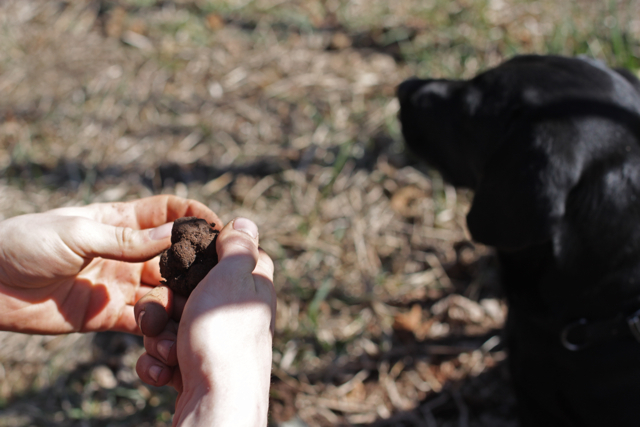 I’m always amazed that although truffles can be farmed, humans are still at the mercy of dogs to sniff them out for us to find. It adds to the mystery these funghi already possess. To an onlooker, watching a spritely little black dog show us the way is the highlight of the hunt. Shadow points out the hiding spots of several handfuls of truffles, ripe, dark and intense now that it’s the end of the season. He circles the base of the tree, bare-branched thanks to winter, hovering over a spot he finds particularly interesting. 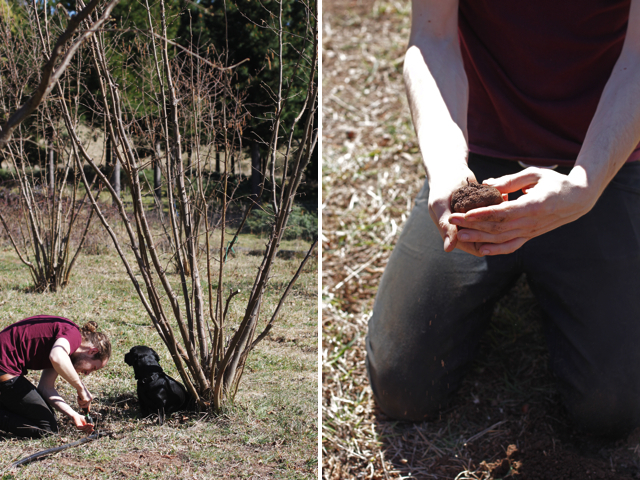 Gus, the Marshalls’ son, digs a little, then excavates carefully with his hands until the knobbly, reptile-skinned truffle can be lifted out. Shadow does a victory rub in the dirt and sausage treats are awarded. A successful run around the hazelnut trees with Shadow and a bucket full of truffles later, we head back to the farmhouse for some lunch (a delicious truffle and mushroom tart prepared by Gus and for dessert, truffle ice cream made by Canberra-based Dream Cuisine), accompanied by a good chat. I mention to Kate that I’d taken one of her truffles to my friend Rob Kabboord, chef and owner of delightful Melbourne restaurant Merricote, a European style bistro in Northcote. He marvels at the marbling and the intense nose and eventually shows it to his truffle source, who comes back saying it’s the best truffle he’s seen in Australia this year. No small feat. As I tell Kate, I have a feeling she’s not surprised to hear this, but she is beaming like a proud mother. After lunch our morning’s haul, dusty from the dry, sun-drenched earth of late, are scrubbed clean with Japanese brushes and rinsed under the tap. They are gleaming, black little beauties. Kate sends us off with the truffles, some dried truffle flakes (her latest experiment, crisp and mushroomy) and truffle honey (another experiment). Back at home with my hoard of these beautiful truffles, I’m ready for some experiments of my own. First, some truffle butter, made with homemade butter inspired by this charming Pepe Saya video. Then, truffle gelato, a sort of stracciatella al tartufo with finely chopped pieces of the darkest chocolate mingling with finely grated black truffle, inspired by a recipe given to me by Merricote’s Rob. It’s addictive, with that unique umami back note, a flavour that lasts long after you’ve savoured that first taste. 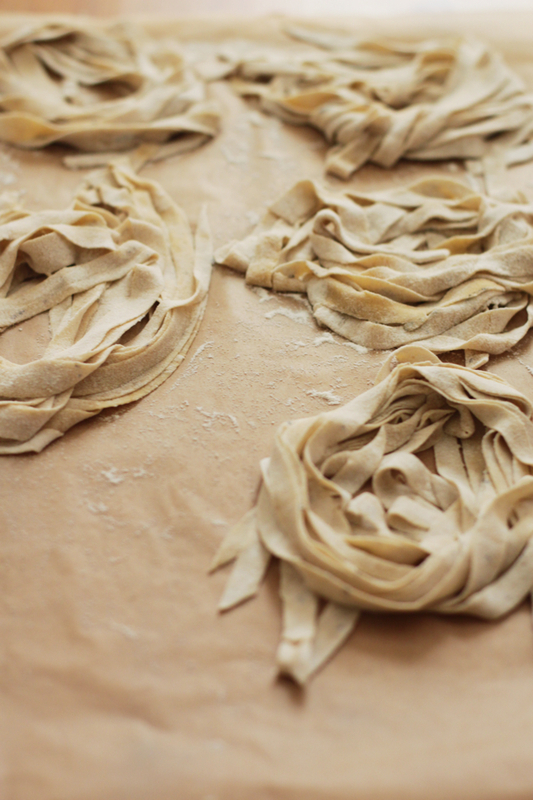 Then, truffle pasta. Truffle grated into the pasta dough, then served with the cooked pasta in a quick ‘sauce’ of cream and Parmesan. Later, shaved over a freshly whipped up carbonara. 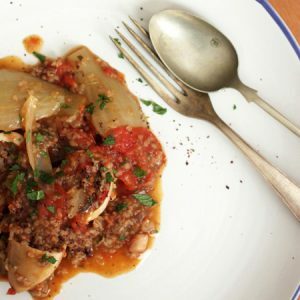 Then again piled onto a flavoursome Umbrian pasta recipe, competing with anchovies and garlic, alla norcina, inspired by Elizabeth Minchilli’s recipe. Next, fondue. Oh, the fondue. A Piemonte style, normally made with white truffles, but this one, of fontina, milk and egg yolks melted together in a heavy Le Creuset saucepan, laced with shavings of black truffle, does both the truffle and the age-old recipe from Nonna Genia’s cookbook justice. A pile of toasted, crunchy woodfired bread happily disappears. Luckily I remembered Kate saying to keep the truffles with your eggs; the eggs will absorb some of that delicious aroma. On the last day with supply running low, the simple meal of silky scrambled eggs perfumed with their neighbouring truffles and layered with the last of the homemade truffle butter and crisp truffle flakes, is also one of the most satisfying. These earthy, dark, fiercely seasonal, fragrant truffles, the “diamonds of the kitchen”, as Brillat-Savarin so famously called them, are prized for good reason. 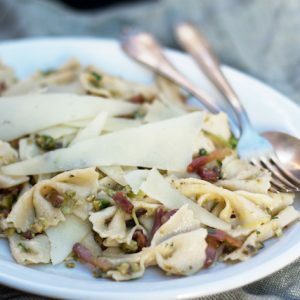 But their best side is brought out with the simplest and most humble uses in comforting home-cooked fare – the sort of dishes that have long traditions in Italy’s most bountiful truffle regions. 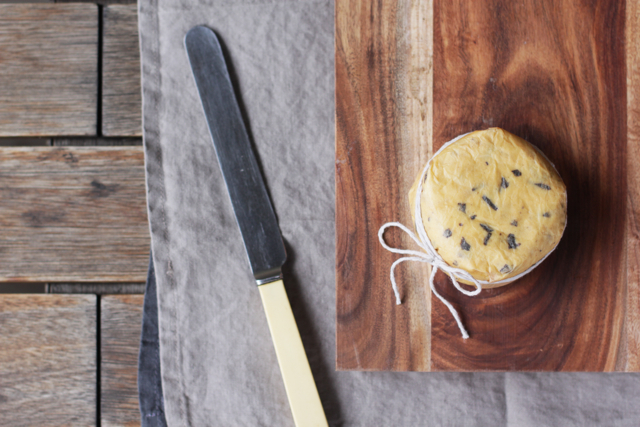 Some cheese, some eggs, fresh pasta or some toasted bread are probably the best vehicles with which to enjoy the complexity and unique aroma of black truffles. 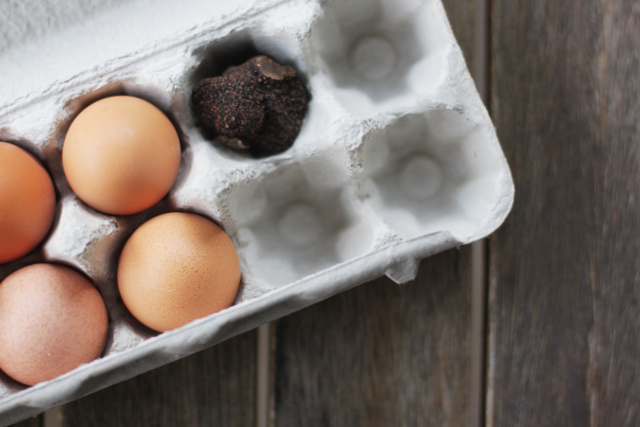 Some tips for eating and storing your truffle at home: Use it as soon as you can, the fresher it is, the more aroma it has. Store it at an even temperature (don’t keep it in the fridge door), wrapped in absorbent paper towel, in a jar (or – with your eggs!). Change the paper towel daily. 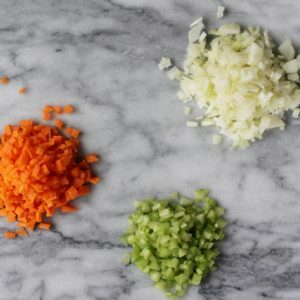 Grating or slicing it raw is best; heat it only very gently as some of the aroma will be lost with heavy cooking. Make cultured butter as shown in this video by artisan butter maker, Pepe Saya. Before wrapping up to put in the fridge, add freshly grated truffle and combine well. Truffle butter can be used to stir through pasta, mashed potatoes, polenta or scrambled eggs at the last minute; it’s wonderful left to melt over a perfectly grilled steak or boiled new potatoes. Note that this homemade butter does not keep like store-bought butter; use within a week. Make a crème anglais base or a fior di latte base such as this one (minus the rosemary) with a little less sugar than normally used. Churn the gelato as usual and at the last moment, add finely chopped dark chocolate (at least 72% cocoa) and finely grated black truffle. Oh, that is something I’d love to experience once in my life! 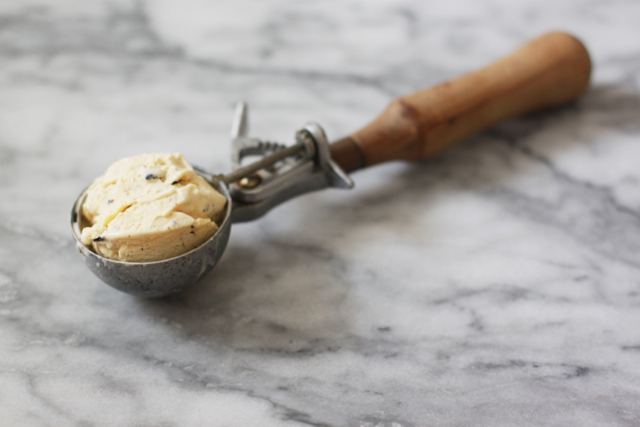 Truffles taste so good and that butter would pair perfectly well with rye sourdough bread. Oh that does sounds nice! Have you tasted ever? which species (types) of truffle ? Great post! 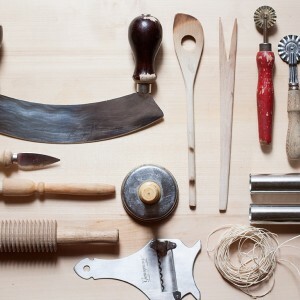 I”m off to a truffle ‘farm’ today, where they organize truffle hunts in the fall, and sell their own truffles. FYI, my neighbors here in Umbria find so many truffles that they preserve them by simply putting them in a baggie and then popping them in the freezer! I had never heard about freezing truffles – those Umbrians with their copious amounts of truffle! I suppose you wouldn’t do this with the very best truffles but maybe the plentiful summer ones? Truffles IN the pasta? That’s a revelation for me! Yes and yes! 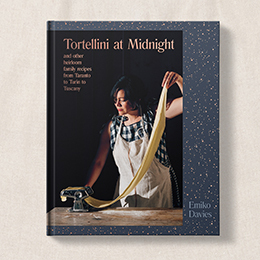 You must be one of those people that are truffle-blind – only kidding! White are my favourite too but I’m biased (and spoilt) since Marco comes from one of the world’s few white truffle producing areas It took me a while after so much white truffle eating to enjoy the black truffles too, but I even like the scorzone spring/summer truffles. I think as well that there are good truffles and there are not so good truffles – and that makes all the difference. And yes, they should be cherished (prices will help that!) 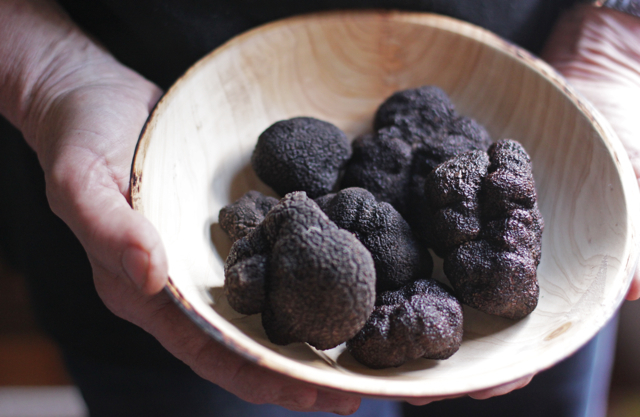 but interestingly, in the Middle Ages, foraged truffles were food of the peasants – there’s some food for thought! DO NOT waste your time eating Chinese truffles. They are just rubbish with zero flavour, as you have already found out. Save your money for the Blacks. Grazie mille Maura e benvenuta! The tagliolini are my favourite. What a lovely thing to read and look at first thing on one of the first chilly autumn mornings. I’m so amazed you have truffles over there, but indeed why not! I love truffle, of course I can have it very rarely, in fact I think it’s been since that time Giulia shared her truffle with me and Zita 3 years ago. Wow, that looks amazing! 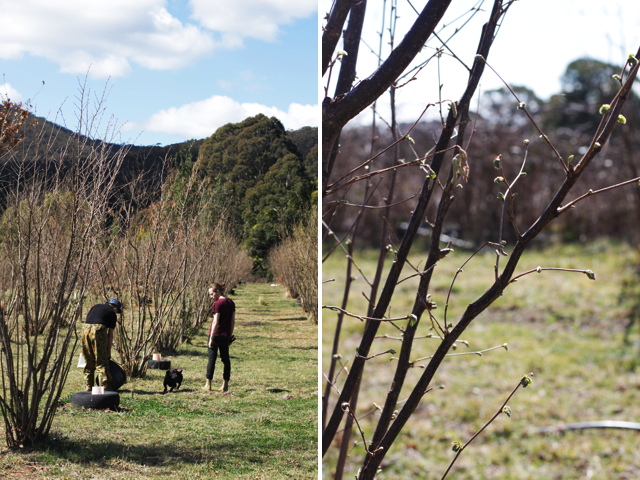 I didn’t realise there were truffle farms in New South Wales – I thought they were all in Western Australia and was totally bummed that we wouldn’t be able to visit one in November, as they’ll be out of season. Fantastic to know there are farms on this side of the coast. As I am reading your comments, I might have changed my mind from my favorite type Tuber Melanosporum to white onem or whatever, I have not tated the white one, would you please, one of you, clarify to me what does the white taste? and why all of you, did choose his/her favorite at first place? on which base did you choose? price or taste? 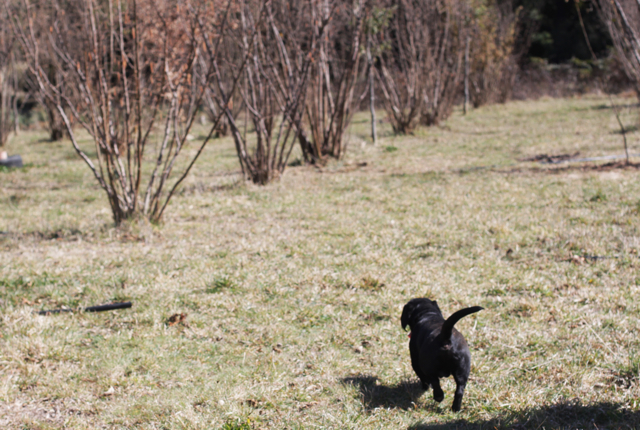 Truffle Hunting in Umbria is an old age tradition. Umbria produces the highest number of black truffles in Italy, and the quality of the truffles is famous throughout.